Rishi Markandeya tells his disciples in 16 Slokas the ways to remove the obstacles faced by devotees while reading Devi Mahatmya. Reading of Keelakam brings blessings of the Devi, spiritual harmony, peace of mind and success. Of this Keelakam Stotram, Lord Shiva is the Rishi, Anushtup (eight syllables in a pada) is the meter, Mahasarasvati is the deity and it is recited for the love of Shri Jagadamba as a part of Durga Saptashati. Om, I bow with respect to the greatest Lord, who has three eyes and who wears the crescent. Whose knowledge encompasses the wisdom of the Vedas and whose pure devotion lead to the ultimate bliss. Anyone who understands the Key (Keelakam means the nail which holds the cart and the wheel together, in this context is the key that unlocks the secrets of the Devi Mahatmya) to the mantras of the Devi Mahatmya and recites them with constant intent attains complete success and full peace. Those who praise the Devi by reciting or singing these mantras, shall certainly succeed in thwarting every single adversity (whether external or internal, and whether physical, mental, or spiritual) and in achieving the highest realizations. Those who praise the Devi by reciting or singing these mantras need no other mantras or medicine, or anything else and will realize all their needs. Those who praise the Devi by reciting or singing these mantras find the greatest relief from every doubt in the world and are filled with perfect bliss. There is no end to the blessings that can be received by the Devi Mahatmya. The secret is that it must be offered to the Devi with the utmost devotional focus so that She will be pleased and will accept it. Without any doubt, who recites those mantras with full concentration, and especially on the fourteenth or eighth day after the new moon (Krishna Chathurdasi or Krishna Ashtami), attains bliss. The one Key of the Great God (Shiva) is that devotion alone brings Her grace. As one gives, so in return does one receive, and by no other means is She pleased. Whoever constantly recites the Devi Mahatmya using the Key, surely becomes perfect, a divine attendant, even a celestial singer. Wherever such a person goes, he is free from all danger and fear. Such a person is not subject to untimely death, and when the death of his body does come, then he is surely saved, attaining full liberation. Now, knowing all this, one must begin and continue to practice it. By not doing so, even the gift of understanding will perish. The wise ones devote themselves to what brings complete fulfillment. 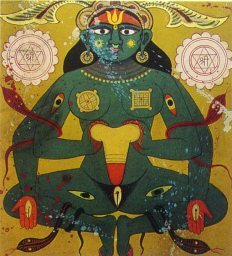 All felicities, beatitudes, and other auspicious qualities formed in femininity come about through the grace of the Goddess. Therefore, one should recite with devotion the Devi Mahatmya. Even when that scripture is recited softly, its success is resounding. For complete fulfillment, one must proceed. When the blessing of the Supreme Sovereign, through Her grace, is welfare, health, fulfillment, the destruction of all enmity, and supreme liberation, why should anyone not praise Her so? Here ends the Keelakam Stotram of the Devi.